Jim tells Helen that he doesn't want to be reminded of Charlie Slater. 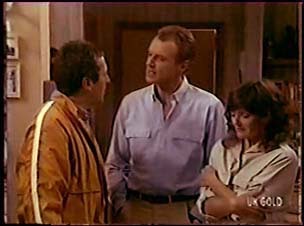 Charlie Slater tells Paul that he and Jim should get together some time. Squawker the budgie pecks Des. Gloria and Paul find Gloria's mother crying outside their mansion. Gloria's mother cries that Charlie has locked her out. Paul goes to talk to him, but Gloria says Paul should just take them to a hotel. Paul protests and goes to knock on the front door anyway. 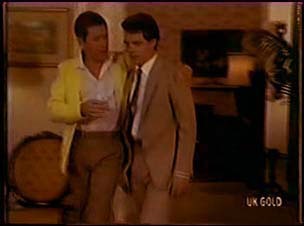 Charlie invites Paul in for a drink. He's obviously drunk and drinking more by the second. Paul tries to reason with him, but he says he has just thrown Gloria's mother out and doesn't want her back in. Then he throws Paul out too! Paul tells Gloria and her mother that they can stay at the Robinsons rather than a hotel. They head off. CHARLIE:(through the window) And don't bother to bring her back! He collapses unsteadily into an armchair, still drinking. Gloria's mother is apologising to the Robinsons for their intrusion. Helen lends them some nightclothes and insists that they don't need to go to a hotel. 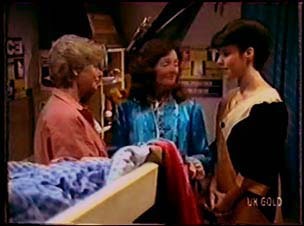 Gloria tells her mother that she has to leave Charlie. In the kitchen, Paul is telling Jim about his conversation with Charlie. Jim apologises for the way he carried on about Gloria before. Helen has made up Scott and Paul's bunk bed for Gloria and her mother. When Helen has gone, Gloria's mother starts to cry again. Jim and Paul are chatting about Charlie Slater. 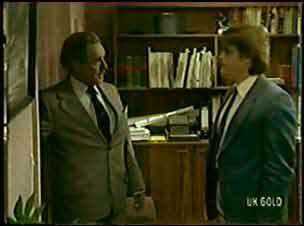 Jim explains about his aversion to Charlie Slater - but maybe it's just as well that he didn't strike it rich. If they'd ended up like Charlie they'd be much worse off, despite the money. Gloria's mother tells Gloria that she's angry with herself - she's been such a fool for putting up with Charlie. She resolves to tell Charlie that he can't hurt her anymore. 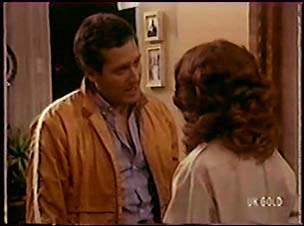 Gloria tells Paul that her father has been drinking heavily for four or five years. She wishes her mother would do something about it. Paul hugs her. Charlie has arrived and Gloria's mum comes out to talk to him on her own. He tries to hug her, but she fends him off. Charlie starts apologising for his behaviour, but she's not having any of it - she says she's not coming home. She can't take anymore - Charlie has done this once too often. She wants a divorce. Charlie is very angry and says she can't survive without him. He goes to hit her, but Jim comes out. JIM: Not in my house, Charlie! Well...long time, no see. Charlie is angry with Jim for his part in things, but Jim pointed out he was just giving his wife and daughter shelter when they needed it. He storms out. 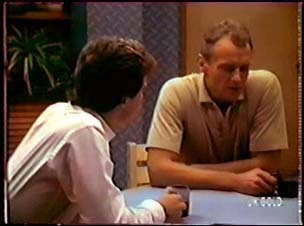 Max comes in and finds Terry sitting at the kitchen table. He invites her to go on a job up to the mountains for a couple of days. It's urgent. Terry says she had something organised and isn't very pleased. MAX: Are you doing the job or not? MAX: OK then, you're sacked. MAX: You keep out of it. Paul comes in looking for Shane. They chat in the living room. Paul says he's got a lead on a job for Shane - there's a company called Fielding Enterprises going as a chauffeur to the boss. He gives Shane the number and tells him to ring up quick. Shane immediately goes to the phone. Lucy is asking Helen why Mrs Slater married Mr Slater in the first place (she's been stickybeaking!) Helen says it's really none of their business. Julie says that a new bank manager is starting today - a Mr.Martin who has transferred from Interstate. 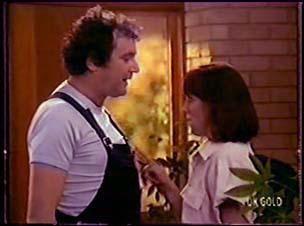 Shane tells Maria that he's got an interview for the chauffeuring job. 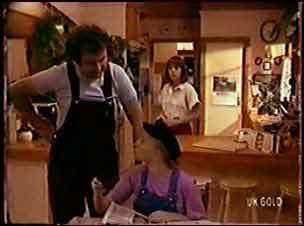 Just then, the new plumber's apprentice arrives and Max introduces him to Maria and Shane. They head off to work. Shane is appalled that Max has fired Terry. Max and his new apprentice are already at odds - the new apprentice apparently lost his driving licence a few weeks ago for being over the limit! Max isn't pleased (to say the least) and tells the new apprentice to clear off. Max comes in on a rant and says that the boy's father set him up. Maria says it's no-one's fault but Max's for firing Terry. Maria says she'd better get a job herself if Max can't hang on to his assistants! Maria tells Max that Terry was everything he needed - she was highly qualified, liked the work and could put up with Max(!). Maria refuses to step in with the driving and tells Max to give Terry a ring. Max goes to find Shane to help him, but Maria stops him, saying Shane has got a job interview. Besides, Shane thinks Max's decision to fire Terry stinks - and Maria thinks the same. She laughs, knowing Max is beaten. Jim is wolfing down his breakfast when Paul comes in. 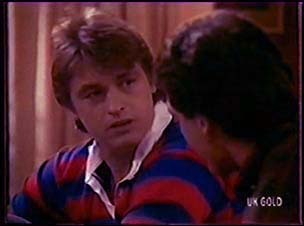 Jim tells Paul that he's very proud of the way he handled the Slater situation. He says Helen has been great too. They are both pleased. Julie is in a rush to get into work and bumps into a man, causing him to drop his newspaper. She helps him pick it up. She explains that she's anxious to get to work because there's a new bank manager starting. Shane is dressed up in a suit ready to go to his interview. He has a go to Max about Terry as he passes. Maria wishes Shane good luck and crosses her fingers for him. The interviewer has had a look at Shane's medical record and says it shouldn't be a problem. The interviewer is a bit concerned that Shane will find the job a come-down after training for the Olympics. But Shane says he just wants a job - he likes driving and getting out and about. The interviewer explains that the hours could be quite long, but there's a chance for overtime, and paid holiday too so the conditions are quite good, really. The interviewer offers Shane the job - he can start tomorrow. He tells Shane to call at the suppliers for a uniform. Max is ringing around trying to get a replacement plumber's mate - he's completely stuck without a driver. He can't get anyone. While he's on the phone, Terry comes in through the back door. She wants to know why Max sacked her - why did he get rid of her. She threatens to take him to the Equal Opportunity Board. This doesn't go down well with Max, and he starts yelling at Terry that he knows she has a husband and that she should keep away from Shane.